It's astonishing to think that it's just fifteen years since the landmark series Space Things first aired. The show was praised for its sophisticated approach to storytelling, its willingness to tackle adult themes and all the spaceships and monsters and shooty laser battles and everything. Its creator, Josh T Muffitt, now directs multi-billion-dollar epics involving flying superheroes and spaceships and stuff, and is widely considered the King of the Geeks. But it's interesting to consider his humble beginnings and so here we present, direct from MGM's archives, Muffitt's initial pitch for his ground-breaking show. I have got a grate idea for a film or a TV show or something. 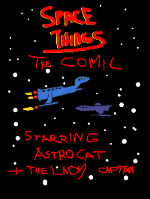 It would be called 'Space Things' and it would be a sci-fi spectacular set in space. It wuould would be all about a spaceship in space called the SSSS Graham (SSSS stands for Super Special Space Service).